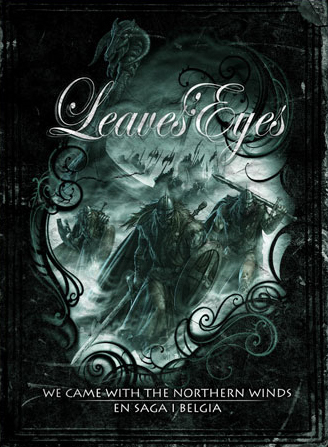 LEAVES' EYES — the German/Norwegian band formed by ex-THEATRE OF TRAGEDY singer Liv Kristine Espenaes Krull and members of ATROCITY — will embark on an autograph tour through some of Germany's music superstores in support of its new DVD/CD, "We Came With The Northern Winds - En Saga I Belgia". As a special bonus, the group will perform special acoustic sets during these signing sessions. In order to celebrate the release of the new DVD/CD, LEAVES' EYES will bring "We Came With The Northern Winds - En Saga I Belgia" to the big screen. Select UCI movie theaters in Germany will present the audience with a one-of-a-kind movie experience. LEAVES' EYES will release "We Came With The Northern Winds - En Saga I Belgia" on February 27 via Napalm Records. The set "will have a total playing time of approximately six hours," according to a press release. "The first disc comprises 'We Came With The Northern Winds', a band documentary with a running time of two hours. The movie highlights the band's career and offers fans an exclusive and intimate glimpse into the world of LEAVES' EYES, as well as presenting the viewer with impressions of past tours (222 concerts spanning over four continents and 34 countries). The second disc documents LEAVES' EYES' memorable headlining gig on October 20, 2007 at the Metal Female Voices Fest in Wieze, Belgium. The show featured the legendary Viking longboat stage set, as well as a setlist full of fan favorites. The package also delivers a double audio CD of the show as a special bonus." "We Came With The Northern Winds - En Saga I Belgia" will be released as a deluxe eight-panel DVD digipack and slipcase as well as in CD format as a deluxe eight-panel digipack and slipcase. Commented guitarist Thorsten Bauer: “This DVD package definitely makes my day. It contains the fulminant 'En Saga I Belgia' show. Every fan of monumental and spectacular stage shows will be enchanted! Additionally, one DVD contains an extensively produced documentary about our band which shows everything what we have done and what happened to us with the band during the last five years. The viewers can watch all this within two hours of entertainment and excitement. When I watched the final version for the first time, with all the tour episodes from North and South America, Europe, Mexico and Australia, I got goose bumps several times. With this movie, the viewer can get a very close experience with our band; he will be taken with us on our world tour!" DVD1 - The Movie: "We Came With The Northern Winds"
DVD 2 – The Concert (playing time 91 minutes): "En Saga I Belgia"
Audio Portion - Double Live CD: "En Saga I Belgia"